Sunday sees the 18th edition of the Vattenfall Cyclassics; the latest in a string of races to please the sprinters and classics specialists. It’s not the most prestigious race, but it nevertheless provides a valuable opportunity to pick up some WorldTour points and to get some hard racing into the legs before the World Championships. It’s a race that always produces fast, aggressive riding, with the classics specialists looking to spoil the sprint teams’ fun. The 245.9km route starts and finishes in the beautiful city of Hamburg in northern Germany. The riders head out on a large loop to the south of the city before returning to make a shorter loop to the west. The action then switches to a 12.6km city centre circuit, before a furious dash to the finish line. The area surrounding Hamburg is generally flat, but don’t for one minute think this is an easy race. The organisers make the best use of any hills they have. The southern loop includes one small climb quite early on, but the real test comes on the city centre loops which include four ascents of the famed Waseberg, the last one only 15.5km from the finish. At 300m long with a steady ramp of 15%, the Waseberg is tough. Expect to see repeated attacks and selections on this climb, as the classics specialists try to drop the out and out sprinters. After the last ascent, it’s a furious dash to the line, with teams all trying to gain position into the last turn 2km from the finish. From then on it’s a no-holds-barred dash to the line on the famous Mönckebergstrasse. This is the only WorldTour race held in Germany. In common with many one day classics, the Vattenfall Cyclassics Elite race is part of a whole series of events for riders of all ages and abilities. The associated sportive events are among some the best attended in Europe. Defending champion John Degenkolb (Giant-Shimano) is racing at the Vuelta this year. The six most recent editions of the race have all finished in a sprint. Tyler Farrar (Garmin-Sharp) is the only rider to have won the race twice since it’s inception in 1996 (2009 and 2010). All 18 WorldTour teams will be on the start line, with the organisers also inviting the German pro-continental team NetAPP-Endura as their wildcard selection. Wondering about the name Vattenfall? Prior to 2006 this race was know as the HEW Cyclassic, the sponsor HEW being the Hamburg electricity plant. In 2006 HEW was renamed as Vattenfall Europe Hamburg, hence the renaming. Although there will be fierce attacks on the last ascent of the Weseberg, the flat 15km run to the line should ensure that this race will come down to sprint. However, the long distance plus those leg-sapping ascents means we need to look for a strong rider; the sort that revels in a hard finish. 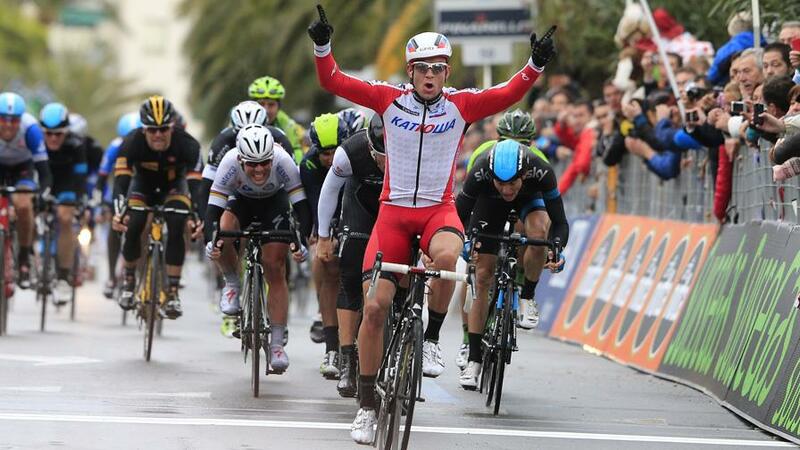 Alexander Kristoff (Katusha) is the perfect example of a sprinter who likes a tough parcours. Winner of Milan San Remo, two stages at the Tour de France, and coming from some hard racing at the recent Arctic Tour of Norway, he’s sure to be there or thereabouts. Without doubt the two fastest men at the race are Marcel Kittel (Giant-Shimano) and Mark Cavendish (Omega Pharma-Quick-Step), but will they survive the climbs? If they do expect fireworks at the finish. If not, both teams have plenty of other options to play including both Luka Mezgec for the Giants, and winner of the tough last stage of the Eneco Tour Guillaume Van Keirsbulck for OPQS. Andre Greipel (Lotto-Belisol) has had a quiet year by his standards, but this is a race he likes and does well at. Having finished on the podium three times in the last three years, I’m sure he’d like to take the top step. Arnaud Demare (FDJ.fr) won this race in 2012, but is another rider who has been rather quiet since his spring races, which saw him take second place at Gent Wevelgem, and first on GC at the tough 4 Jours de Dunkerque. Never underestimate Simon Gerrans (Orica-GreenEDGE). The winner of Liege-Bastogne-Liege, has both the ability and the race smarts to do well on this parcours. Tyler Farrar (Garmin-Sharp) also does well on this route and would love to add a third win. If he can replicate his early season form (second at both Schilderprijs and Dwars door Vlanderen, and second in three stages of Ster ZLM) he could well be on the podium again. Other names I would expect to feature at the finish are the in form Ben Swift of Sky, and Tinkoff-Saxo’s Matti Breschel – both having recently put in excellent performances the Prudential RideLondon Classic and the Eneco Tour respectively. Although it may be a little too tough for them this year, watch exciting young guns Bryan Coquard (Europcar) and Sam Bennett (NetApp-Endura). I’d love to see them involved at the finish. Highlights will be shown by Eurosport in the UK (16:45 – 17:45). For other coverage check cyclingfans.com.